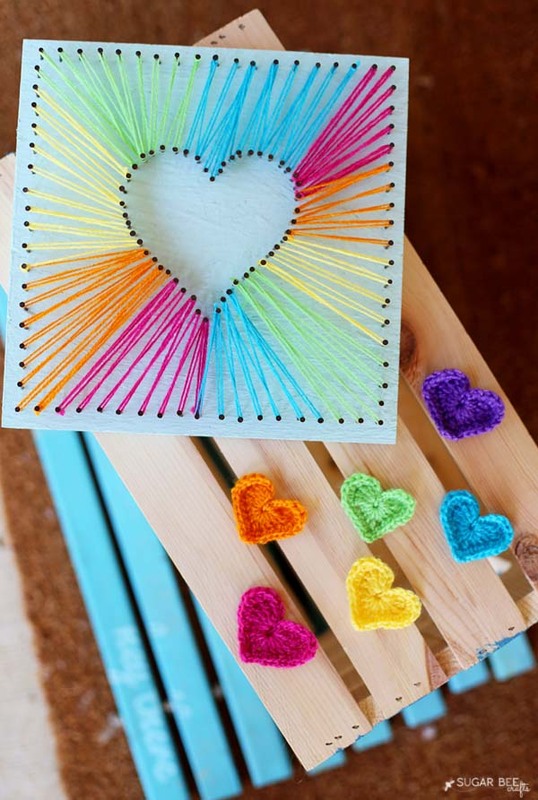 String art is a very popular way to express your artistry and have lots of fun. Here is everything you need to know about this cool technique. String art is also called pin and thread art, is defined by a pattern of colored thread wrapped between points to form geometric figures or representational designs such as a ship’s sails, sometimes with other artist material comprising the leftovers of the work. 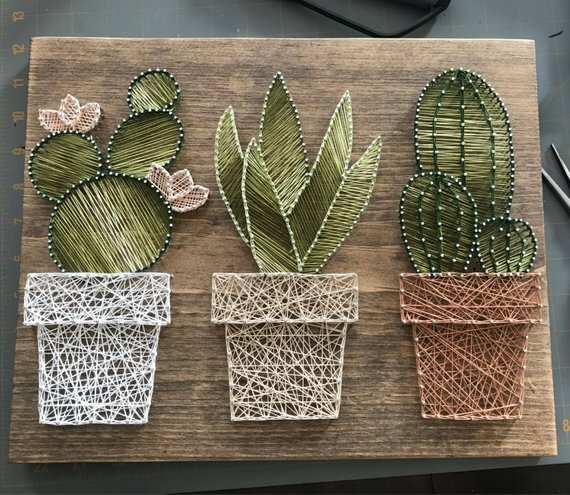 How to make string art? Mastering the geometric string art patterns require a lot of patience and enthusiasm. As a matter of fact, there are several step-by-step tutorials on the internet that can be quite helpful if you want to start practicing this technique. 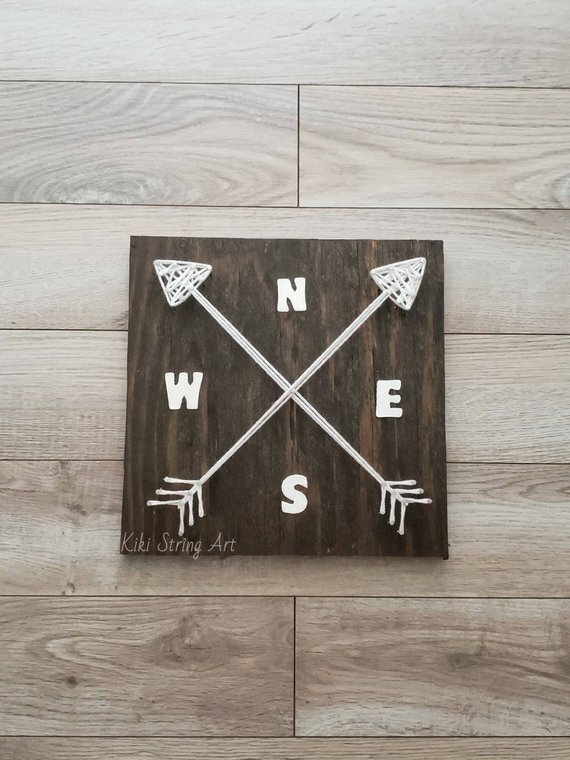 Where to get free string art patterns? You can browse our selection of more than 30 free printable string art templates here. What kind of string to use for string art? The kind of string you use depends on the look you want to create. 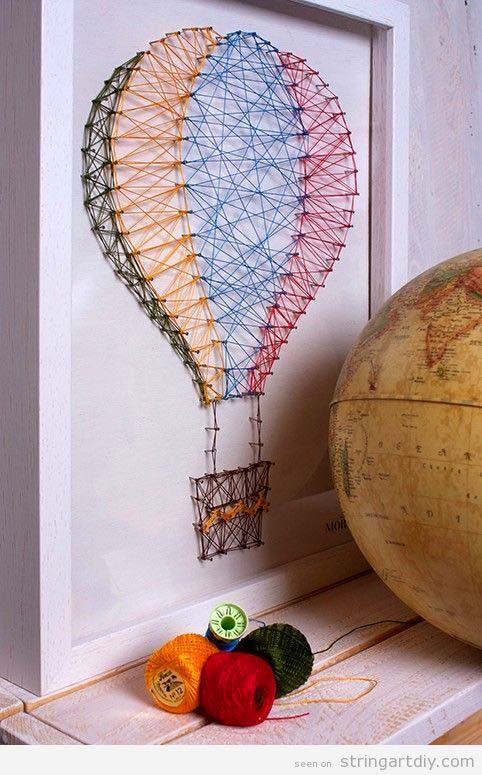 For instance, an embroidery floss is a good option for more gentle pieces of string art. From the other hand, the wool and thicker strings are great for pieces that pack a punch. 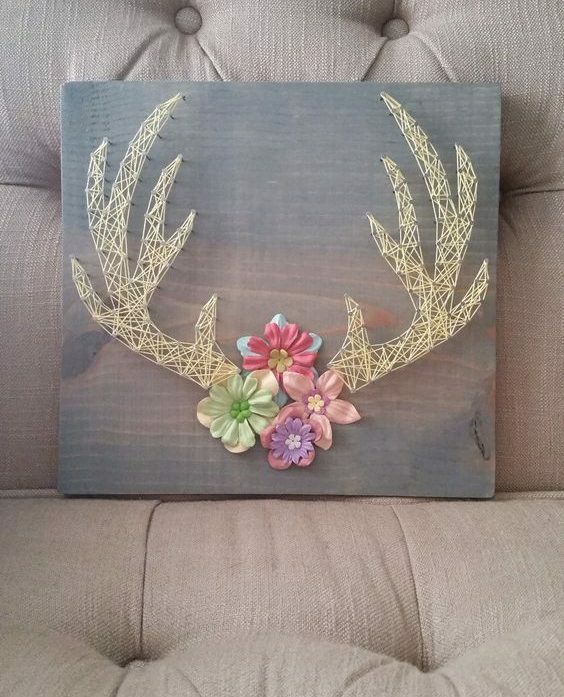 What is needed for DIY string art? Woodblock, canvas, or cork floor tile. Glue, double-sided tape, or some method of adhering surfaces. Printed string art pattern or stencil. Embroidery floss, wood, or yarn in the desired colors. 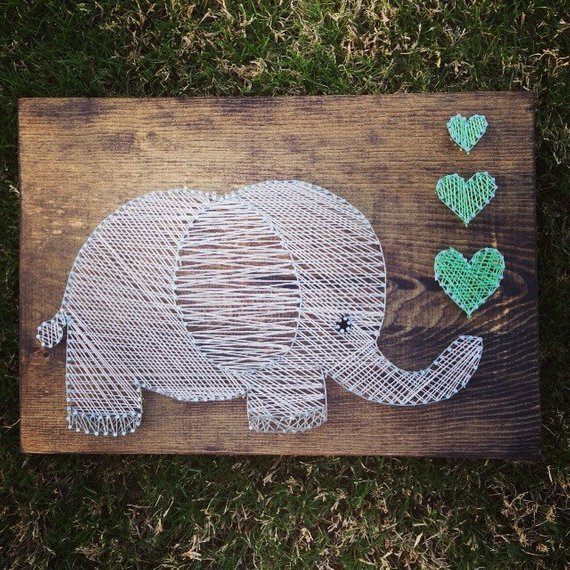 To get you inspired, I present you 28 creative DIY string art ideas. In case you don’t have enough time to make them yourself, I’ve included the links from where you can directly order them. This one is our original Mason Jar string art project with detailed step by step instructions, materials neeeded and video of the process. 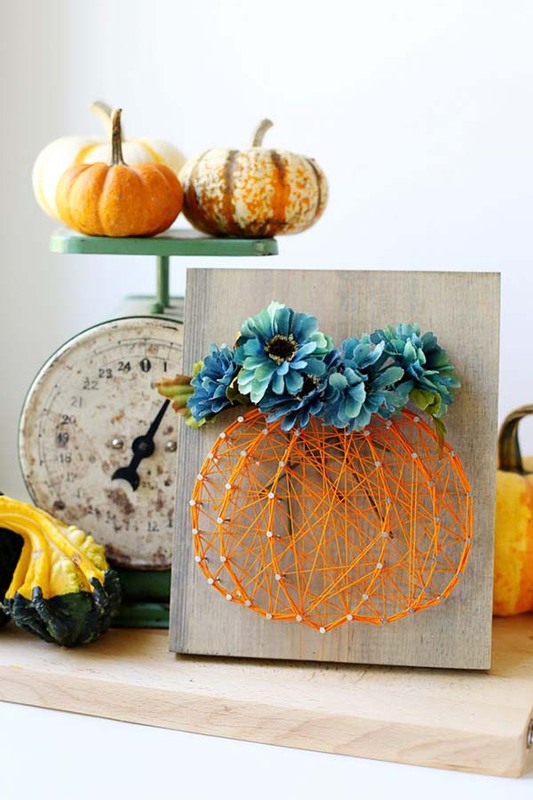 This pumpkin art idea will ideally fit your fall interior decoration. Adding the floral element in blue gives this project even a more joyful and cute look. Idea: Creating a sign “BOO” or “SPOOKY” and combining it with the pumpkin, go to another category – unique Halloween ideas! 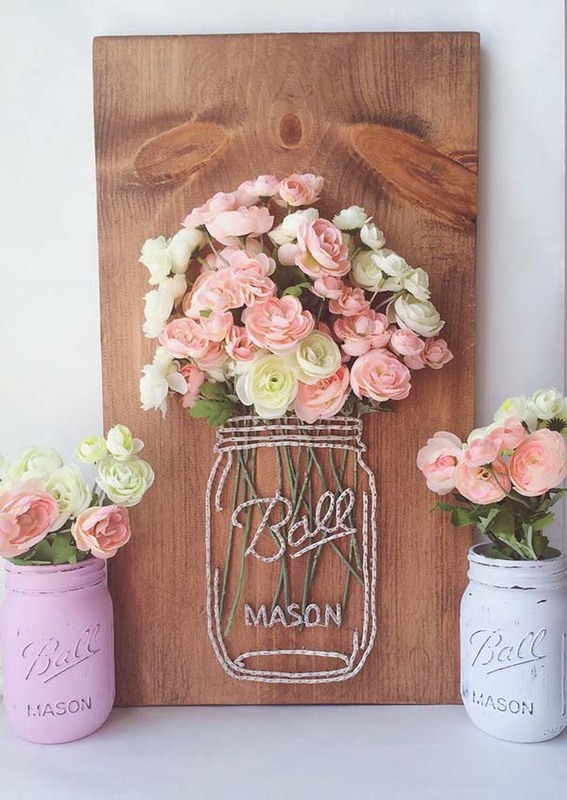 I’ve been planning to a string art with a bunch of different-sized mason jars and various kinds of silk flowers in them. I simply fell in love with this idea when I first saw this photo on Pinterest! Guess this is how we get our greatest ideas…one thing leads to another. 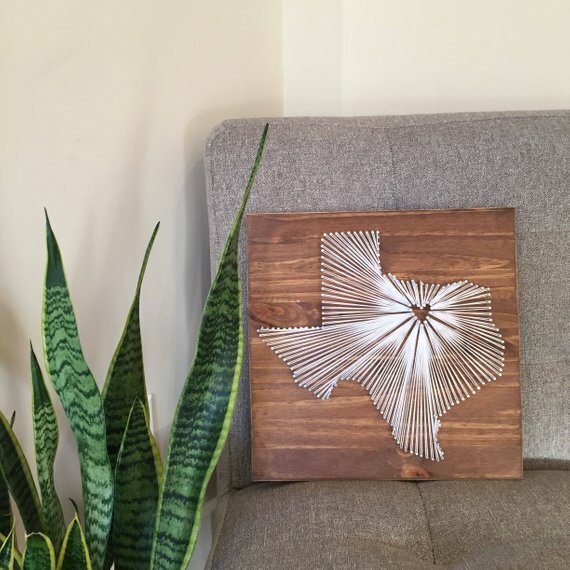 This is surely one of the templates that can be a great personalized present from someone originally born in Texas. The cute little heart placed over is showing the location is memorable for you. It shows that you have left you a tiny bit of your heart wherever you may go. 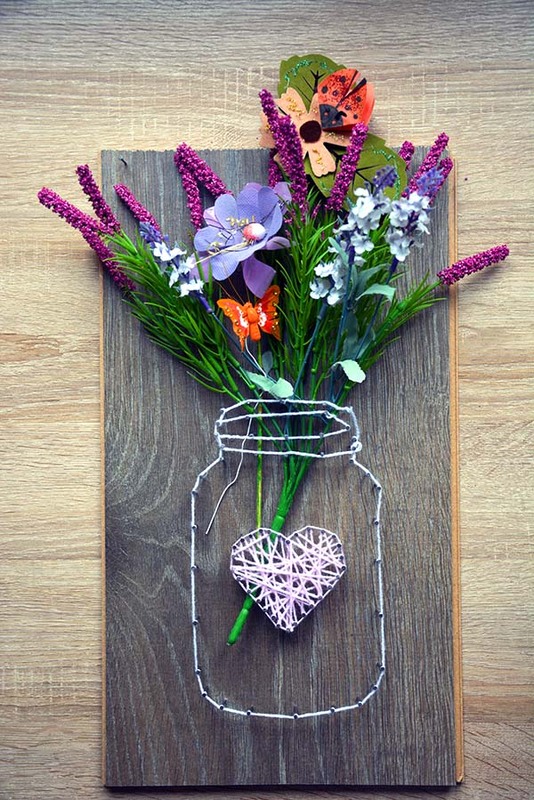 Buying string art kits for someone special who love crafting DIY projects can’t be a wrong decision! Besides, this sunflower is very cheerful and rhapsodic. Moreover, this technique is a cool way for kids to develop their creativity and to learn how to be more patient. 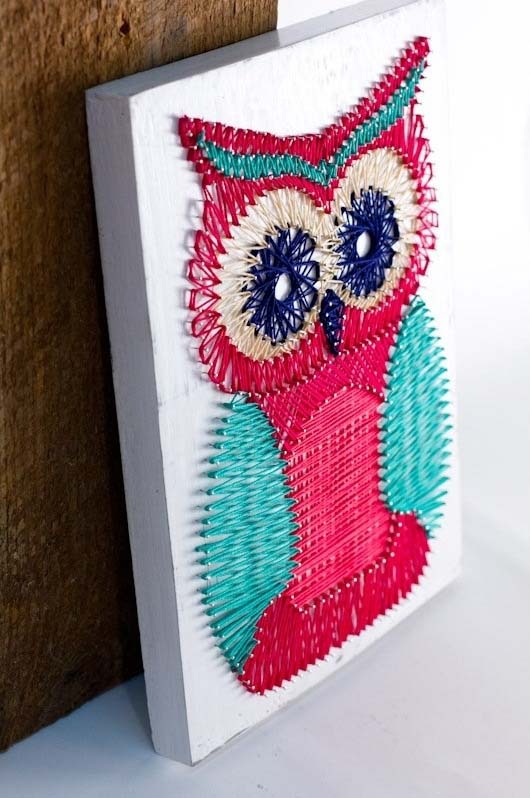 This colorful owl string art piece is an ideal addition to your nursery, kids bedroom or playroom, don’t you think? 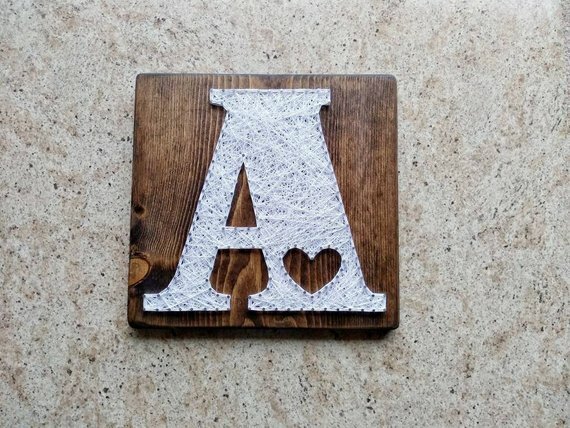 You can use a larger wood so there’s enough space to “write” your kid’s name (using the string technique). Such a great idea for a Christmas present! 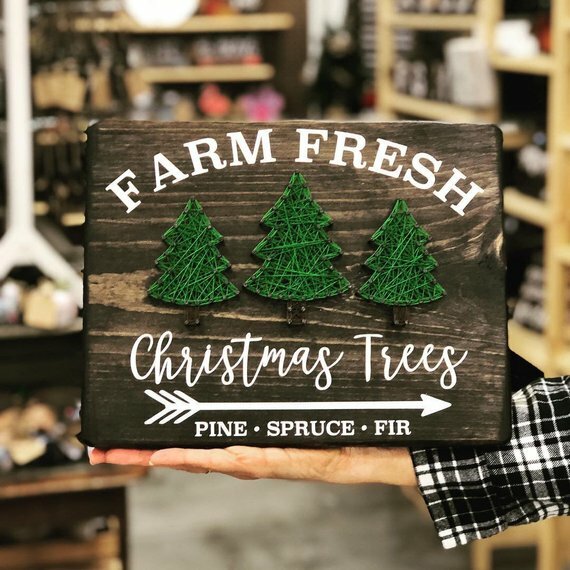 This festive tree is a great last-minute holiday decoration that is cheery, inexpensive, and simple enough for the whole family to make! Plus, it adds a bit of a rustic vibe to the living room space. Of course, you can customize this DIY project according to your own taste and style. Imaging having this cute (completely handmade) elephant hanging on the wall in the kids’ bedroom or in the baby’s nursery? Isn’t it adorable? It surely is one of my most favorite designs! 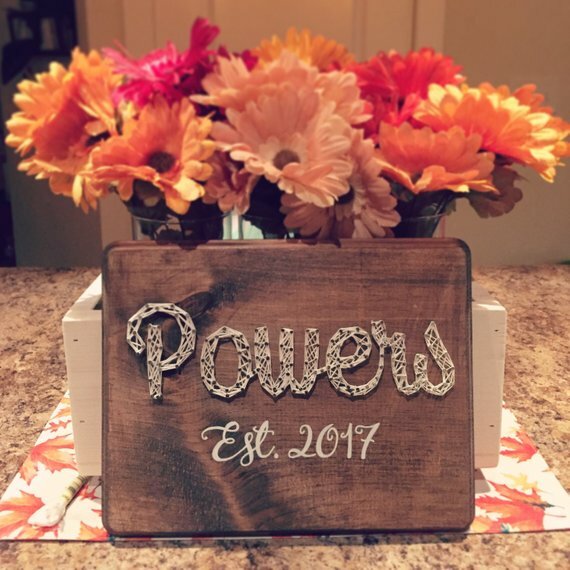 This beautiful DIY string art sign can be the perfect addition to any home or the perfect wedding gift for your best friend! The easiest way is to prepare the sign in Photoshop or Illustrator and then print it out. Use your imagination and print the sign that is most suitable for the particular case. Another great anniversary, wedding, or a long-distance love gift idea! It’s very personal, sentimental and heart-warming. 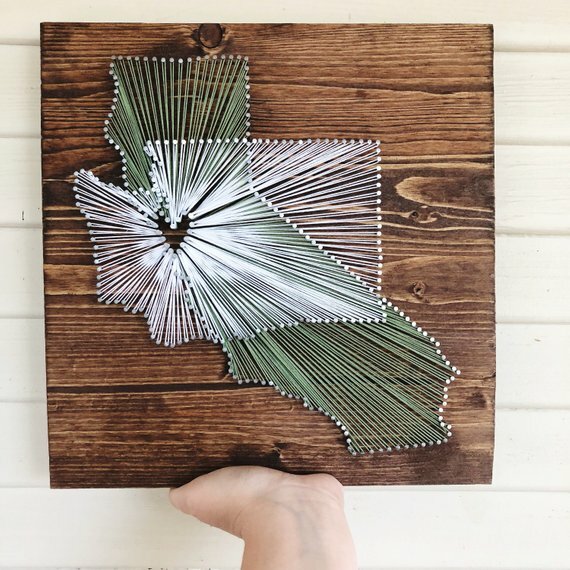 While creating this DIY project, think of the countries or states that have an emotional meaning for the gift receiver(s). I’ve found this project on Pinterest and really liked it. 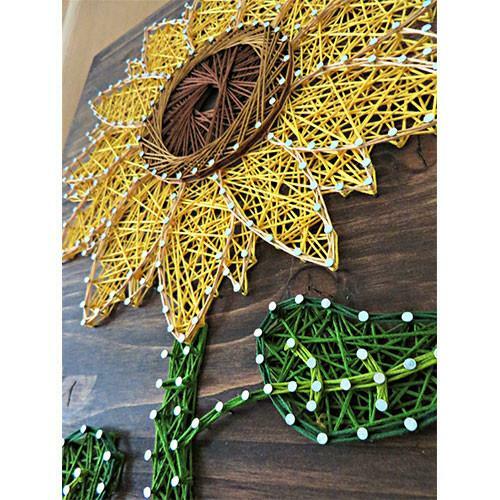 All you need to create this string wall art is a heavy pressed particle board, some white paint, and about 600 nails. 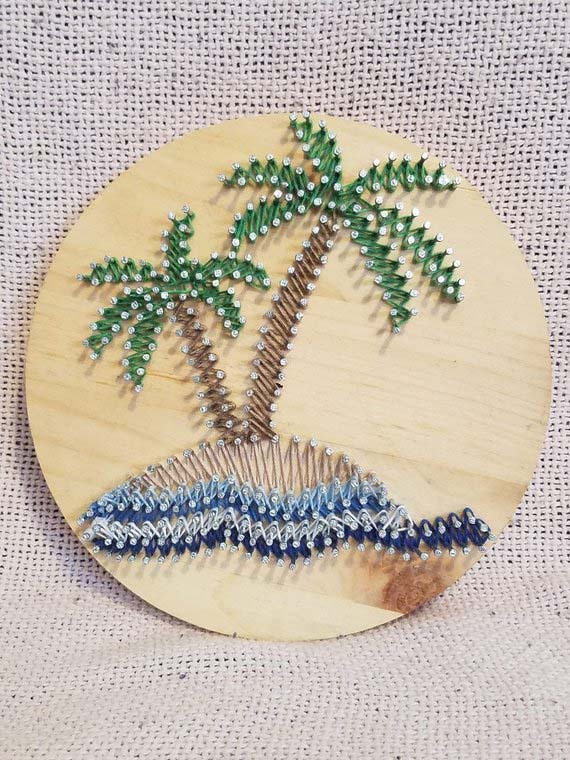 Here is a gorgeous geometric string art – a beach scene for every summer-lover or for those who are looking to decorate their house or living room with a beach motif. 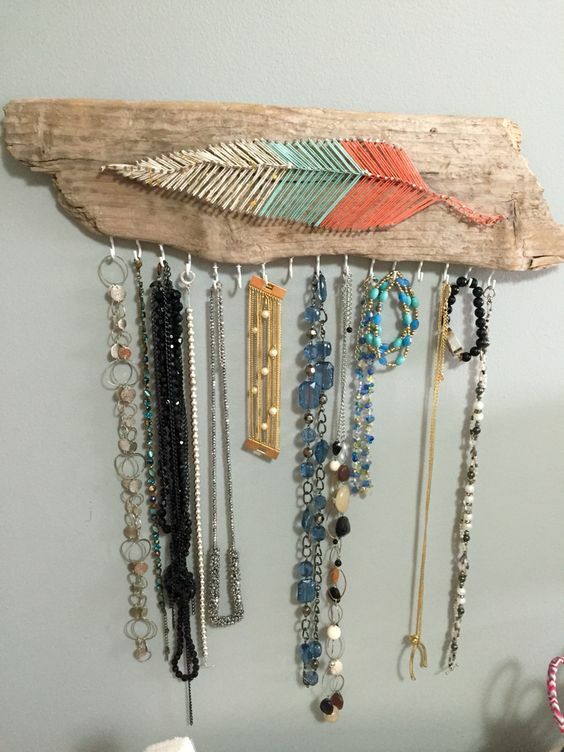 If you’re a crafty kind of person, this beautiful vintage jewelry wall hanger, decorated with a cute colorful feather string art, should be your next project! Choose the colors that fit the rest of the interior and customize it in a way it makes you happy every time you have a look at the hanger. 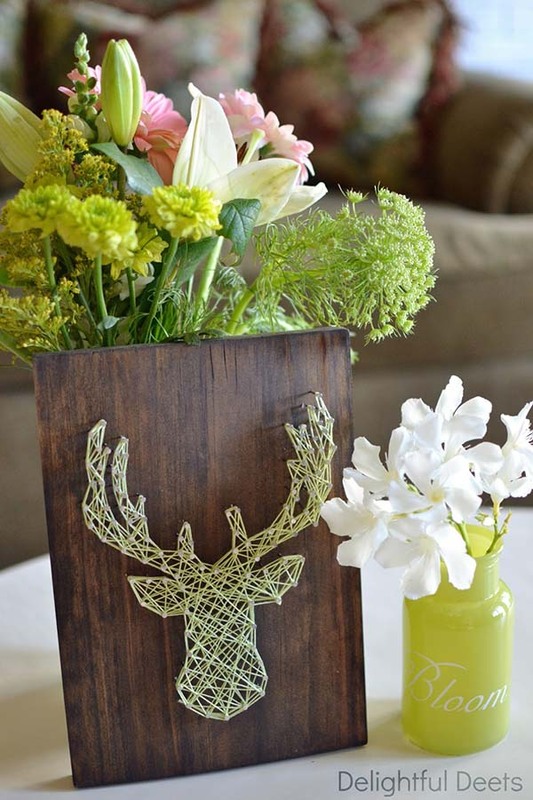 This beautiful deer antler DIY string art project in a creamy palette looks very elegant and ecstatic at the same time, thanks to the decorative floral elements. In my opinion, this project is very girly and delicate so it would look stunning hanging on a girl’s bedroom wall. According to Native American culture, the turtle is a sacred animal because it represents Mother Earth. It also symbolizes the good health and the long life. 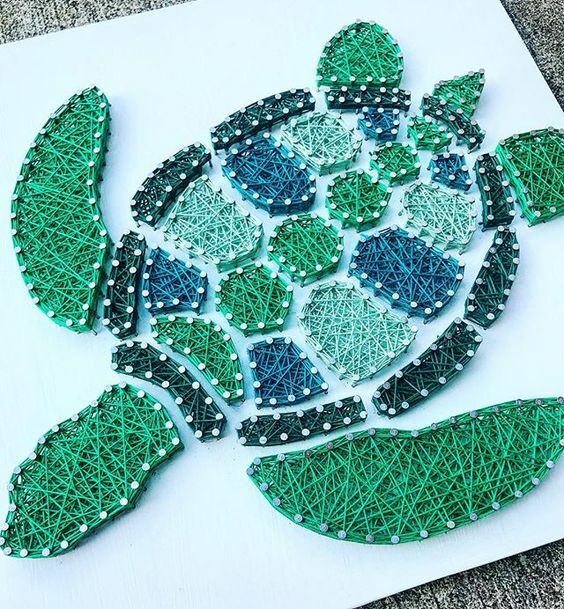 In this line of thinking, re-creating this cute turtle project, and giving it as a gift to someone from your family is a very good idea. 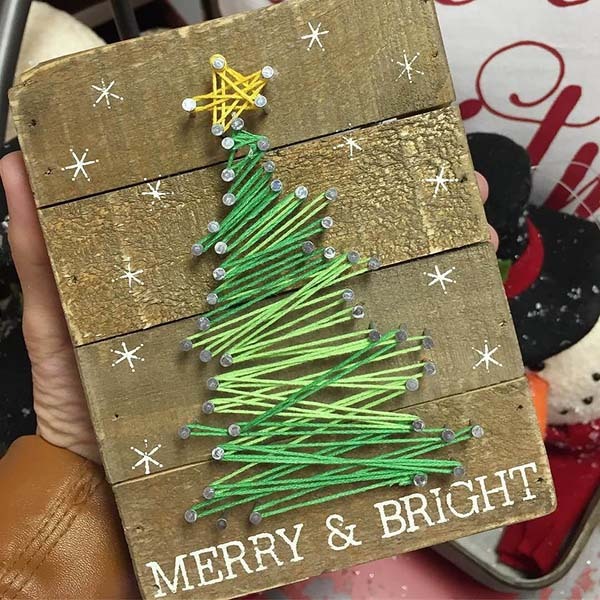 Here is another DIY string art project which could be an ideal Christmas present! The board will look nice tinted with either dark walnut or vintage white. You can also customize the compass by choosing the string color depends on your personal preferences. 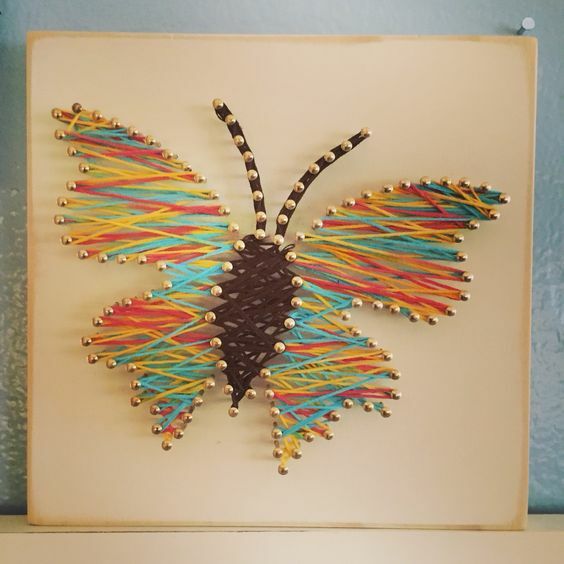 This pulled string art project is entertaining and colorful! Great way to show your love to closest friends or your partner! Moreover, the shape chosen is so simple and easy to make that you don’t need to spend long hours of re-creating it. 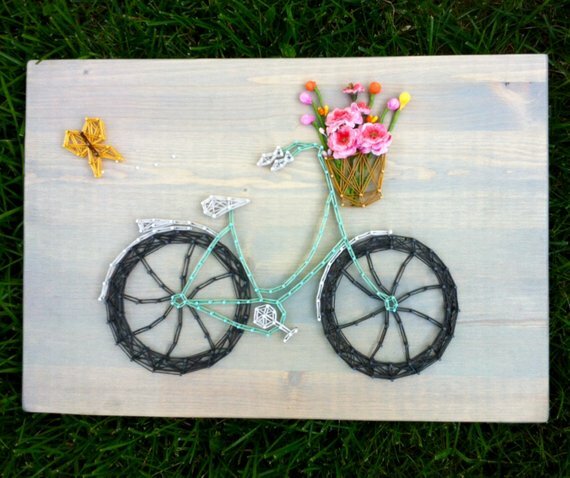 There is another inspiring string art project for bike lovers! When I look at it, it reminds me on a sunny day during springtime, when the flowers are blooming, the sun is sunning, and the day is getting longer! This wall art brings a strong refreshing and joyful vibe. I believe that having some of these positive string art sign hung on the wall at home, makes you more relaxed and happy on a daily basis. The colors are very soft and cheery, the font is very bold and shows individuality. It is surely a very personal and timeless gift. Butterflies are not just beautiful, they are also deep and powerful representations of life. In many cultures, they symbolize the wandering of the human’s soul. This geometric idea looks very natural and rustic. It can literally fit almost all kinds of interior decor – from contemporary to farmhouse style living rooms. 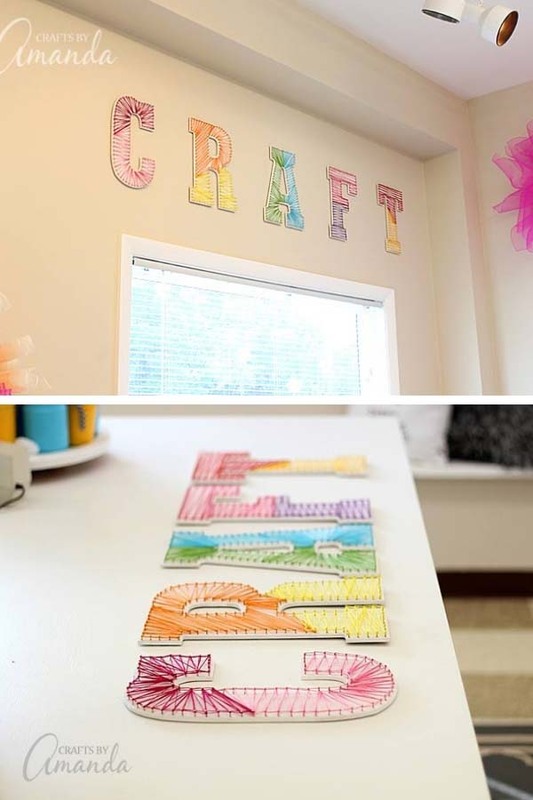 I would display this colorful large CRAFT string sign in the office so it would remind everyone that we should apply our imagination and artistry in everything we do. Love the contrast between the white letters and the dark walnut. 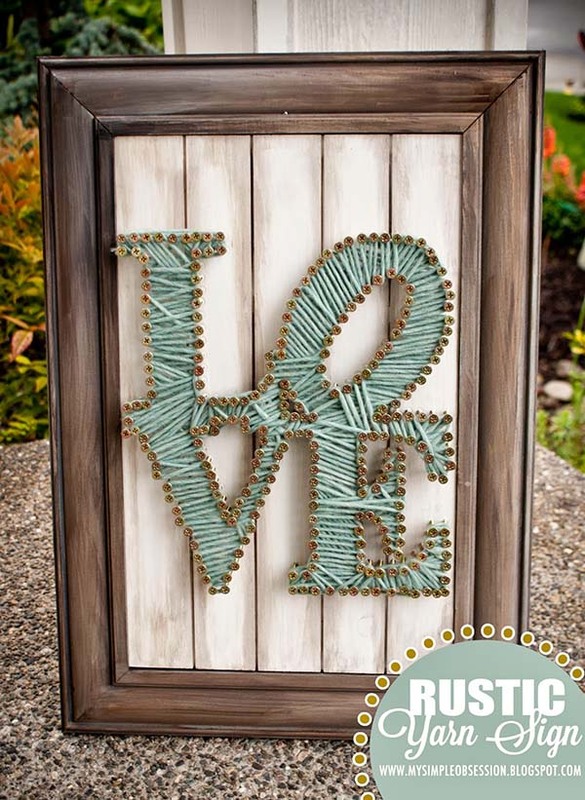 Besides, this DIY string art project brings a strong unpretentious rustic vibe and additional warmth to the living room. It may also look lovely hanging on the wall in the entrance hall. 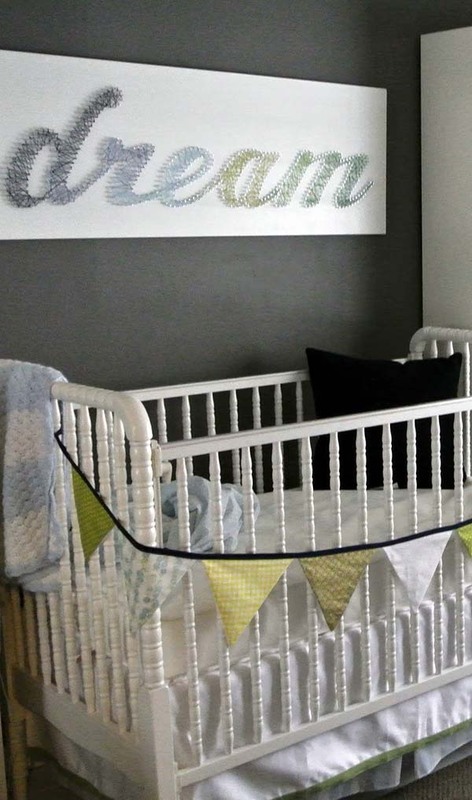 Even though this is one of the most time-consuming string art ideas, I decided to share it with you as it could be the ideal final touch to your kid’s bedroom. It is fun, it adds texture and will easily transform into every room’s centerpiece. Cactuses are unique, beyond incredible plants with a funny shape! 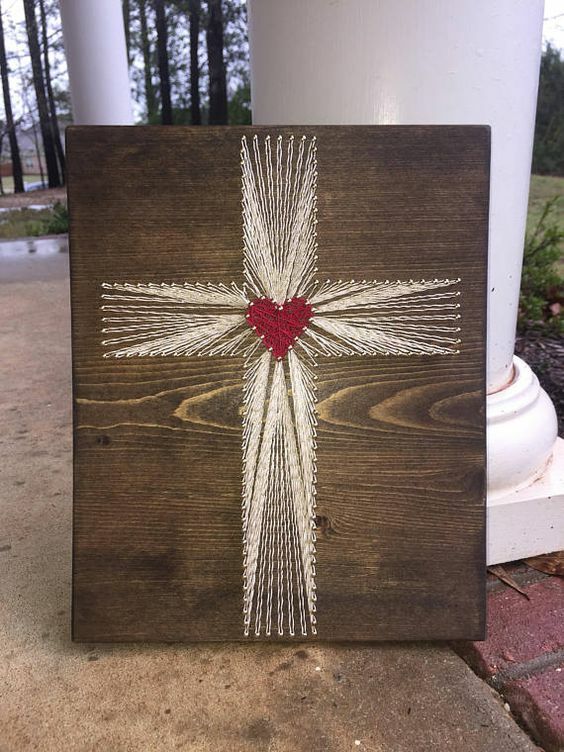 This beautiful creamy-colored cross string art project made of a sawtooth hanger is also a great handmade gift for Easter or for Mother’s day. I just love the tiny red heart that becomes the focal point of this wall art. 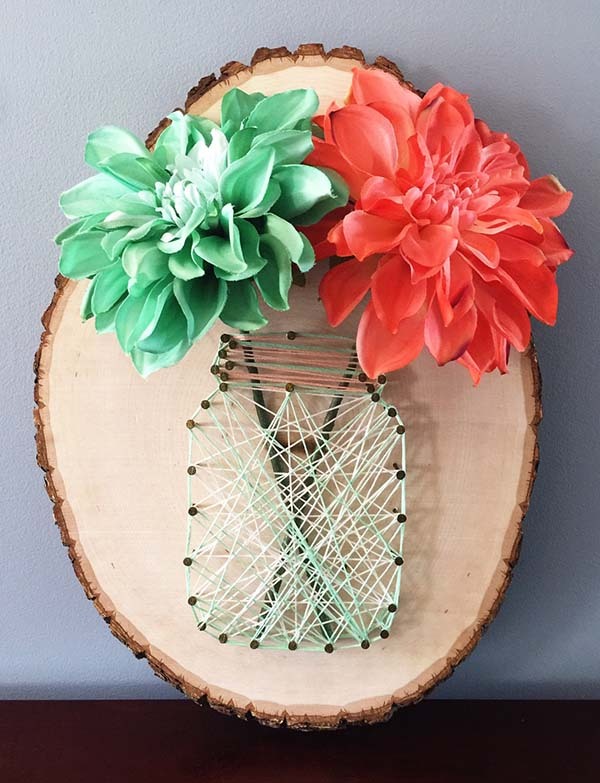 If the Mason jars string art patterns are something you like, here is another project you can try to re-create. The enormous flowers rock the boat in a good way and make this DIY project very unique and lively.